This volume is devoted to the study of the St. Petersburg collection of Middle Persian and Parthian Manichean manuscripts from Chinese Turkestan. 36 documents of the collection were published by C. Salemann in the opening decades of the 20th century. The Manichean fragments received inventory numbers, 83 in total, and are now being published in transliteration accompanied by Russian translation and comments. A facsimile edition of all manuscripts is added. 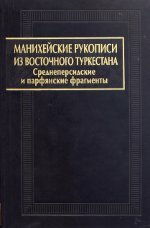 The introduction contains a brief essay on the history of the St. Petersburg collection, on Manichean literature, on the history of the Manichean doctrine and its founder Mani. An analysis of the main Iranian Manichean terms and a description of the Manichean Middle Persian follow. The volume is provided with a glossary, a bibliography and indices. The St. Petersburg Manichean collection includes fragments of homilies, prose treatises and poetic texts. Among the latter there are fragments of cosmogonical hymns (S9, S13), hymns to Jesus (S6, S9, S34, S41), to the Living Self (S8), a hymn in honor of community (S7), the Parthian hymn Angad rosnan (S53), etc. W. Sundermann, who had worked on this collection, pointed out that, among the prose fragments, there is one (S52) resembling the Book of the Giants, the Chinese Manichean Treatise and the Coptic Kephalaia, two small fragments (S46, S47) resembling the Sermon of the Light Nous and a fragment (SI I) resembling the Sermon of the Soul. The content of many St. Petersburg documents remains obscure because of the poor state of their preservation, but since they were found in the same area as the fragments of the Berlin collection, they can be used to fill many gaps in the Manichean fragments of the latter.